There are two common problems people have with logging in to Canvas. If the device you are using is logged in to multiple Google accounts (Gmail accounts) when you first log in to Canvas, this error message is almost guaranteed. This error also pops up when the server is too busy-- which frequently happens right at the end of the term. 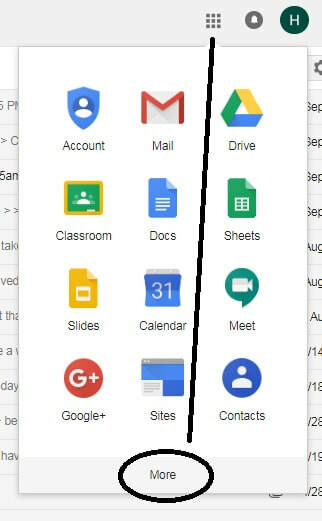 Log out of each and every Google account used on the device. (It isn't enough to close the window. You must actually log out.) Then log in using your @alpinesd.org gmail account. After this, you should be able to add the other Google accounts (reopen them on the device), and from then on, the Canvas login will ask you which one to use. But the first time, you have to log all the others out. The method for solving problem 2 (below) should also work for this. 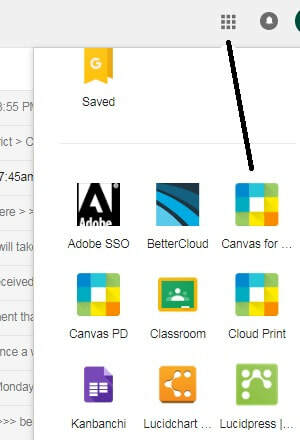 Log into your @alpinesd.org gmail, and get to Canvas through the google apps button in the upper right corner next to your profile pic. ​Click the 9 dots (the symbol you use to get to Google drive), then choose MORE. When you click MORE, Canvas shows up there with a colorful square icon. ​This is always the best way to get you into Canvas when the alpine.instructure.com link yields a server error. Reminders and Suggestions for Success! LPHSChem.com: Learn it, Live it, Love it. Hover over the current term, and the units covered this term will appear as a drop-down menu. Hover over the current unit name (in the term’s drop-down menu), and a “Day-by-Day” tab will appear. Clicking on the name of a unit will take you to that unit’s main-page, which lists all the work assigned that unit in one column, and all of the notes in another column. All class notes and all handouts are available on this website for viewing or download. All class handouts appear as links which are printer-friendly pdfs, so if you miss class or lose your assignment, you can print one from home. All class notes are linked so if you miss class and need the notes, need to review or see an example problem, or want to print a copy of the slideshow to simplify notetaking, you can do so easily. All test dates and late-work deadlines are already listed both on the individual unit pages and on the class calendar. You can subscribe to the class calendar on this webpage if you have a Google account. (Instructions are at the bottom of the calendar page.) You can also sign up for updates through Canvas. There are tutorial applets linked with many concepts—these appear both on the unit’s main-page and on its Day-by-Day page. There is an outline-style review posted with every unit—it is frequently labelled “Study for the Unit ___ Test!” These are summaries of all the information students are expected to know for the unit tests. The frequently explain concepts in a different way or with different examples than the class notes, which can be helpful. You are always encouraged to write notes on one side of a 3”x5” card for unit tests. Online homework can be attempted multiple times. An excellent strategy is to start your online homework the day it is assigned, then write down (or print or screen-cap) the questions you got wrong and can't figure out on your own. Go to your teacher with your questions the next day before or after school. That way you can get help before the online homework is due and earn better scores. Questions from online homework very frequently appear on unit tests, and can be viewed again later, as long as you did the original assignment on time. It is always the case that the vast majority of questions from a unit’s online “Unit Review” homework will also appear on the unit test. Always do the Unit Review! Do it the day it is assigned so that you have time to ask your teacher about any questions that stump you. The "day-by-day" page for each unit already shows what we will be doing each day (all the way to graduation!) so you can always work ahead if you need to. Your teacher is always willing to help you if you are willing to come in and ask questions. If you are struggling, come in and ask questions before or after school! The sooner you ask, the better. Don't wait and get behind-- that will only make it worse! There are five chemistry teachers at LPHS (Argyle, Berrett, Erekson, Wagner, Wentz). All five use the same curriculum—same assignments, same class notes, same assessments. If your teacher is not available, you are welcome to go to one of the other chemistry teachers with your questions. We are offering 16 sections of introductory chemistry at LPHS in the 2018-2019 school year. The five teachers work collaboratively and use the same resources, assignments, and schedule. There is at least one section offered every class period. Make sure the email addresses listed in Skyward (for both student and guardian) are accurate! Use the resources that are available. All class notes and all handouts are available on this website for viewing or download. There are tutorial applets linked with many concepts as well. Some students find it helpful to print the "printer-friendly" versions of the PowerPoints to take notes on during class. There is an outline-style review posted with every unit. Some students use these outlines during the units as well, since they often explain things in a different way than the class notes do. This year's classes start on Monday 8/22/16. In this course, you will learn about the physical world around you. Substances can be described by their chemical structure or properties. Substances can be made of molecules and these molecules are made of atoms. When parts come together, the whole often has properties that are very different from its parts. The formation of compounds results in a great diversity of matter from a limited number of elements. When matter combines, energy is absorbed or released and matter is rearranged to make new substances with new properties. Chemistry employs algebra to describe and predict relationships between variables. Throughout the year, you will be applying the basic algebra skills you've learned in math. ​The text we will use in class is Modern Chemistry, by Davis. You may also use the USOE OER chemistry text (free pdf version or print version $5.49) as a resource. You will NOT need to bring a text to class unless your teacher specifically tells you to the previous period. You must have internet access to succeed in this course-- online homework is a staple, and all class resources are linked through this website. If you do not have access at home, make sure you have completed AUP paperwork and plan to spend time in a school computer lab or the media center at lunch or after school. Please be aware that 3rd term comes to an end on 3/18/16. Unit 13 (Nuclear Reactions) is the final unit on your 3rd term grade. We will begin Unit 14 (Electrochemistry) on Day 64, but it will be posted on the 4th term grade. The final late work deadline for 3rd term work is 3/16/16 at 2:45 pm. If you have extenuating circumstances and/or are hoping for mercy and latitude from your teacher, make sure you talk with the teacher as soon as possible. Waiting until the deadline (or after the deadline) makes teachers far less understanding. You cannot receive slacker-pass points if you have not EARNED a passing grade. You may retake ONE unit test on 3/17 or 3/18 if you wish. There were five unit tests 3rd term-- Units 9-13. There is a 90% ceiling on retakes. STUDY for your retake-- if you earn a lower score the second time, you will RECEIVE the lower score! You may study your original test in the classroom on 3/15 or 3/16. It may not leave the room. Photos are not allowed. If you are not available on the two retake dates (3/17 & 3/18), you must arrange with your teacher to do your retake EARLY, or you lose the privilege of having a retake. NO LATE RETAKES ARE PERMITTED.